Carly Rae Jepsen and the cover of Kanye West's latest album, Cruel Summer. Two big pop albums from two very different artists come out today. Carly Rae Jepsen dominated the summer with her viral hit, "Call Me Maybe." She follows up with the full-length album, Kiss. Meanwhile, rapper and producer Kanye West releases Cruel Summer. "Mercy," the single from the album, has been lodged in the hip-hop/R&B charts for the past few months. Both Jepsen and West might aspire to rule the fall music season, but both may fall short. The inescapable summer anthem of 2012 came from a 26-year-old British Columbia singer who ruled the radio, the club and most of all: YouTube. "Call Me Maybe," is a perfect piece of pop confection — and I mean that as high compliment. It's not easy to craft a song that goes over as easily at a bar mitzvah as it would at your parents' silver anniversary party. You could call the song's success "magical," but you'd also have to acknowledge how difficult it is to pull off the same trick more than once. There's surprisingly little thematic or musical range on Jepsen's full-length album, Kiss, despite employing more than a dozen producers and songwriters. Kiss seems content to churn out 11 more songs about teen romantic drama set over fist-pumping dance tracks. Even though she's about the same age as the last two queens of summer — Adele and Katy Perry — Jepsen somehow seems far younger and less versatile. Perhaps she needs another album or so to mature lest she risk joining a long line of one-hit wonders whose hot summers faded into a cold fall. The temperature may also be dropping on Kanye West's Cruel Summer, his third album project in as many years. This one is a group effort that includes over two dozen artists and producers, many of whom are signed to his label, G.O.O.D. Music, like Kid Cudi, Pusha-T, Big Sean and 2Chainz, and some who are not, like Jay-Z and Ghostface Killah. With so many cooks in the kitchen, it's hard for Cruel Summer not to resemble a really expensive mixtape: technically proficient but lacking cohesion. West began his career as a producer but increasingly, he's ceded musical control to others. As a result, much of Cruel Summer sounds like it could have been lifted from a Frank Ocean or DJ Khaled record. In one literal case of borrowing, the album ends by barely remixing a Chief Keef song from the spring. 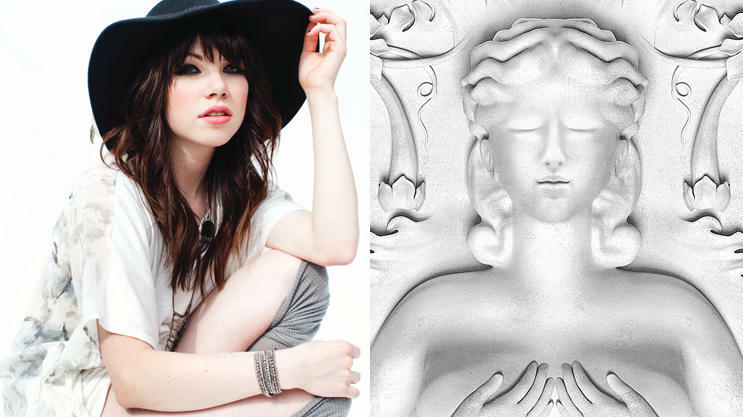 If Carly Rae Jepsen's album suffers from a monolithic sound backing too limited a voice, Cruel Summer has the opposite problem: an excess of voices and not enough of a sonic thread to tie it all together. I used to joke that with West's outsized ego, a little goes a long way, but now I ruefully realize too little West doesn't go nearly far enough. Oliver Wang is an associate professor of sociology at California State University — Long Beach and writes the audioblog Soul Sides. Two big pop albums from two very different artists come out today. Carly Rae Jepsen dominated the summer with her viral hit "Call Me Maybe." She follows up with the full-length album "Kiss." Meanwhile, rapper and producer Kanye West releases "Cruel Summer," a compilation of artists from his label. Reviewer Oliver Wang says both albums arrive with plenty of promise but fail to make good on it. CARLY RAE JEPSEN: (Singing) I threw a wish in the well. Don't ask me. I'll never tell. I looked to you as it fell, and now, you're in my way. I trade my soul for a wish. OLIVER WANG, BYLINE: The inescapable summer anthem of 2012 came from a 26-year-old British Columbia singer who ruled the radio, the club and, most of all, the YouTube screen. "Call Me Maybe" is a perfect piece of pop confection, and I mean that as high compliment. JEPSEN: (Singing) Hey, I just met you, and this is crazy, but here's my number, so call me, maybe? It's hard to look right at you, baby, but here's my number, so call me, maybe? WANG: It's not easy to craft a song that goes over as well at a bar mitzvah as it would at your parents' silver anniversary party. You could call the song's success magical, but you'd also have to acknowledge how difficult it is to pull off the same trick more than once. So there's surprisingly little thematic or musical range on Jepsen's full-length album despite employing over a dozen producers and songwriters. "Kiss" seems content to churn out 11 more songs about teen romantic drama set over fist-pumping dance tracks. JEPSEN: (Singing) This kiss is something I can't resist. Your lips are undeniable. This kiss is something I can't risk. Your heart is unreliable. Something so sentimental, you make so detrimental. And I wish it didn't feel like this because I don't want to miss this kiss. I don't want to miss this kiss. WANG: Even though she's about the same age as the last two queens of summer - Adele and Katy Perry - Jepsen somehow seems far younger and less versatile. Perhaps she needs another album or so to mature lest she risk joining a long line of one-hit wonders whose hot summers faded into a cold fall. FUZZY JONES: (Rapping) Well, it is a weeping and a moaning and a gnashing of teeth. It is a weeping and a mourning and a gnashing of teeth. It is a - when it comes to my sound which is the champion sound. Believe, believe. UNIDENTIFIED MAN #1: (Rapping) OK, Lamborghini Mercy. WANG: The temperature may also be dropping on Kanye West's "Cruel Summer," his third album project in as many years. This isn't a solo effort, though. It's a compilation featuring the roster of his label, Good Music. It features over two dozen artists and producers, including Pusha T, formerly of The Clipse. UNIDENTIFIED MAN #2: (Rapping) Oh, ooh, ooh. PUSHA T: (Rapping) Some claim God body, blame Illuminati. All because his pockets now knotty as his hair. Yeah. All Sonny, no Cher, only solitaires. WANG: With so many cooks in the kitchen, it's hard for "Cruel Summer" not to resemble a really expensive mixed tape: technically proficient but lacking cohesion. Kanye West began his career as a producer, but increasingly, he's ceded musical control to others. As a result, much of "Cruel Summer" sounds like it could have been lifted from elsewhere, maybe a Frank Ocean or a DJ Khaled record. In one literal case of borrowing, the album ends by barely remixing a Chief Keef song from the spring. JADAKISS: (Rapping) Nah, jean jacket with the sleeves cut. Put the pressure on them just when they think that I eased up. Thirty for the Cuban, another 30 for the Jesus. Believe in ourselves when nobody else believed us. WANG: If Carly Rae Jepsen's album suffers from a monolithic sound backing too limited a voice, Kanye's "Cruel Summer" has the opposite problem: an excess of voices and not enough of a sonic thread to tie it all together. I used to joke that with West's outsized ego, a little goes a long way, but now, I ruefully realize too little West doesn't go nearly far enough. SIEGEL: Our reviewer Oliver Wang is an associate professor of sociology at California State University, Long Beach. He also writes the audioblog Soul-Sides.com. WEST: (Rapping) ...because we can't get along, no resolution till we drown all these haters, rest in peace to Whitney Houston. Cars, money... Transcript provided by NPR, Copyright NPR.